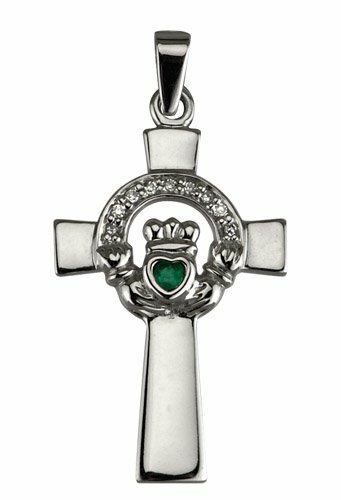 Emerald and Diamond Traditional Celtic Cross with Claddagh Center in 14k White Gold. Beautiful Claddagh detail with a center emerald setting and a halo of round brilliant diamonds. Set with real diamonds and emeralds, this cross is 18mm wide and 34mm high and is fitted with a 14k white gold 18 inch chain and presentation box. Handmade in Dublin and hallmarked at the Irish Assay Office. Shipped for free from Ireland in a beautiful presentation box.